Left to right: Bar III spike necklace, Marc Jacobs one-piece suit, Pop Basic yellow and gold twisted necklace, Marc Jacobs bikini. We all know it's been a rough Spring, so it's probably no surprise that packing for my upcoming Mexico trip was one of the highlights of this past weekend. As you can see, my suitcase is full of blinding brights, fun beachy prints, and a few statement accessories... what more does a girl need? By the time you're reading this, I imagine that I'll be on a beach in Playa del Carmen, sipping a margarita and working on my tan in one of the sweet little swimsuits pictured above (I wound up bringing 6 suits in the end, but who's counting). Hope you're enjoying a little sun wherever you are too! I'll see you in a week, hopefully 10 shades darker. 1. 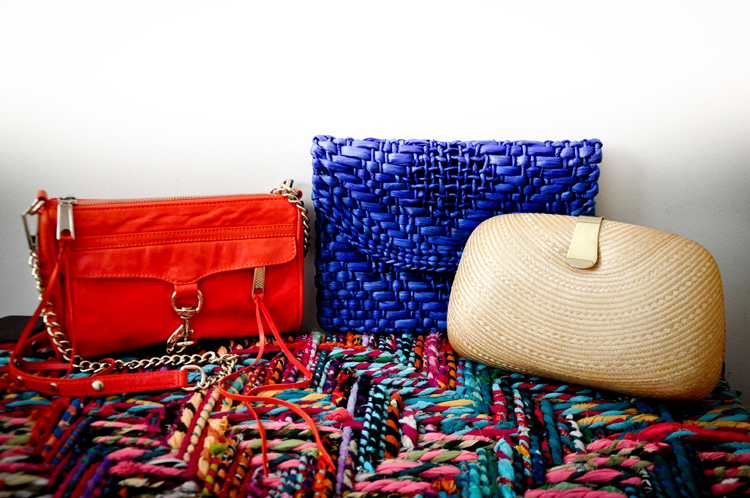 A sampling of beachy clutches (Rebecca Minkoff mini mac, Target blue woven clutch, Vintage shell clutch. 2. A teeny bikini for tanning, and a retro one-piece for lounging; American Eagle bikini and Marc Jacobs one-piece. 3. Bright heels in all heights are essential for any trip; (from left to right) Sea star sandals c/o Fibi & Clo, Forever 21 Colorblocked Wedges, Bezel heels c/o Nine West, 80%20 Clea loafers. 4. These fun Forever 21 cuffs are so light, and perfect to take a look from the beach to the bar. PS. We have a winner in our $300 Beso Giveaway - Congratulations to April from Knocked Up Fabulous! You're gonna the queens of the beach! The one-piece is spectacular and I love all pairs of shoes! I LOVE that bikini top!!! Also loving the bright pink heels. So jealous! Have such a great time! have a great trip!!! sounds like a fantastic getaway...and your wardrobe is so fun & festive! Amazing suits and shoes <3 Love them all! Your swimsuits are so pretty! Gorgeous combination of colours you have chosen - I especially love the bikini! Loving the brights! I really really like the loafers. :-) Have a great vacation! Have fun our your vacay! I love the choices your taking with you! Darling! Those bathing suits are super cute!! Sounds lovely! have a great time in the sun, I love Mexico! And I love those prints from Marc by Marc Jacobs, were looking at them just hte other week but went with the ones with hearts instead. Now I am just eagerly waiting for an opportunity to use them! Hope you have an amazing time in Mexico . Have an awesome time on Mexico so we can all live vicariously through you! Loving the pix, the pink shoes are gorg! !